As demolition moves forward on the historic structure, Bay Area artists are advocating for creative reuse of the steel before it's scrapped and sent overseas. 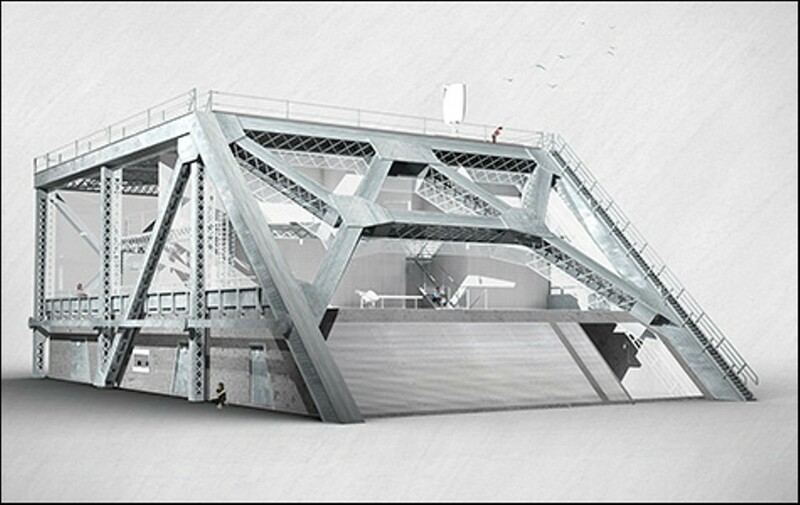 Courtesy of David Grieshaber An artistic rendering of the Bay Bridge House proposal. For more information on proposed reuse projects and the demolition, check out BayBridgeSteel.org, BayBridgeHouse.org, BayBridgeGatewayPark.com, and BayBridgeInfo.org. In the summer of 2012, David Grieshaber was driving over the Bay Bridge when he realized he had no idea what would happen to the structure once the new bridge was complete. So he called Caltrans to find out. After being put on hold for nearly two hours, he reached an agency representative who delivered the news: "The bridge is being demolished and the parts are being sold to China." The thought of all of that steel leaving the Bay Area troubled him. "We should reap the benefits of the material and the bridge that's been here for the past 77 years," said Grieshaber, a technology entrepreneur who lives in Brisbane. "This is part of our history. To see it shipped overseas ... it's borderline appalling." 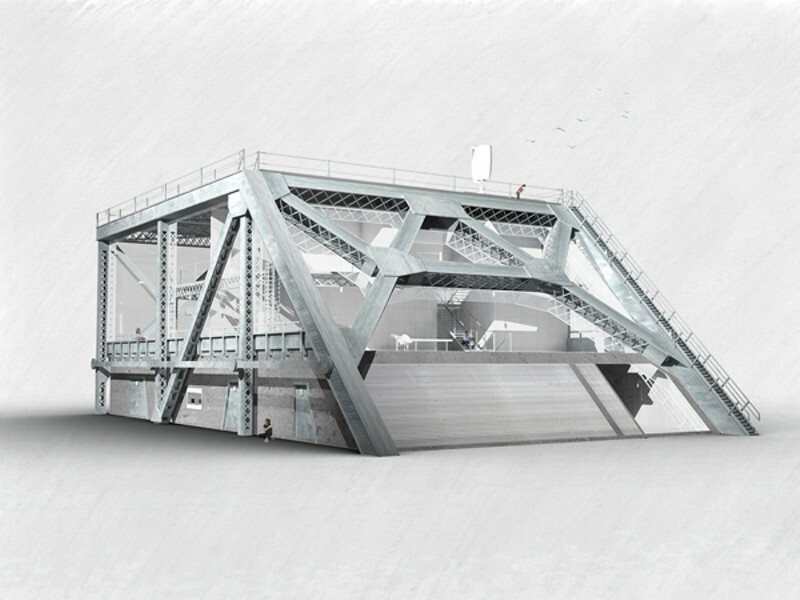 Last week, Grieshaber published a detailed design proposal for the "Bay Bridge House," a multi-use, eco-friendly building made of steel from the old bridge. He hopes to construct the 20,000-square-foot structure — which would include a co-working space, a bed-and-breakfast, and more — on Treasure Island. How exactly he will acquire the Bay Bridge parts, and whether government agencies will assist him, remains to be seen. As it turns out, Grieshaber is just one of many Bay Area residents now expressing interest in repurposing steel from the eastern span of the old bridge, which opened in 1936 and closed last August. In December, Karen Cusolito, founder of American Steel Studios in West Oakland, launched BayBridgeSteel.org, which aims to drum up support for creative reuse of the materials. She and several colleagues involved in art and architecture have been discussing ways to use the steel for years. And as the first phase of demolition now moves forward, the group has upped the ante with a public campaign, including a Change.org petition that has so far garnered more than seven hundred signatures. "It's important that we celebrate the history of the Bay Bridge, rather than scrap it or discard it," Cusolito said. One of her ideas is to incorporate the old steel into a solar art exhibit that could power the lights of the new bridge. While many fear that most or all of the steel will end up in China, it's not quite so simple. For the most part, "What happens to the steel is at the discretion of the contractor," said Andrew Gordon, spokesperson for the Bay Bridge. Caltrans awarded the first demolition contract to two companies, California Engineering Contractors and Silverado Contractors, as a joint venture. The contract covers what's known as the "cantilever truss," a .46-mile stretch on the original eastern span of the bridge near the Yerba Buena Island detour. The demolition process began late last year and involves the removal of more than 40 million pounds of steel from the main span, plus about 4.5 million pounds from the support legs of the towers below the roadway. As of the end of 2013, the contractor had recycled about 3.5 million pounds of steel from the old Bay Bridge. It is the responsibility of the contractor, not Caltrans, to dispose of the materials, and in this first phase, the majority of the steel has been recycled through Schnitzer Steel Industries, a manufacturing company located in Oakland. At Schnitzer, steel from the bridge is being sheared into specific lengths and sold to steel mills both domestically and globally, said spokesperson Jackie Lynn Ray. From there, the metal will be melted in a furnace and remade into various steel products. She said a recent shipment went to Korea, but that the bulk of the Bay Bridge steel the company has received so far has not yet been designated. "It could end up anywhere." Schnitzer exclusively sells to mills, meaning it could not sell materials to individuals, Ray noted. A representative of California Engineering Contractors referred questions to Gordon, who is the official spokesperson for the Bay Bridge project. Gordon noted that Caltrans will advertise a second demolition contract later this year and a third sometime after that. It is during these subsequent processes that Caltrans could facilitate some sort of preservation initiative. The agency "certainly recognizes the historic nature of the structure and that's why we are currently looking into which sections to salvage and what the cost and feasibility of that would be," he said. In other words, there may be opportunities for local steel reuse, but there are no guarantees. One idea being floated is some sort of installation in Gateway Park, the roughly 170-acre waterfront plot in Oakland that extends from the new bridge's eastern span to Mandela Parkway. A working group with representatives from nine government agencies has oversight over this park, and a project proposal is currently in the early stage of environmental review. "One of the things that we've heard over and over again is the interest in large-scale public art," said Karin Betts, spokesperson for the Bay Area Toll Authority, one of the nine Gateway Park partner agencies. Additionally, she said, "There's a lot of interest in remembering the old structure." Officials are investigating the feasibility of salvaging the old steel in some capacity. One of the main, unresolved concerns is how to mitigate lead-based paint hazards from the 1930s-era steel — a challenge that is likely to arise when considering any creative reuse opportunities. "We don't yet have an answer," Betts said. The Gateway Park Working Group is also researching the possibility of leaving in place the 288-foot-long "truss spans" that make up the Oakland side of the old bridge; the idea would be to develop a pedestrian pier from the existing structure. Some oppose this concept on the basis that the old bridge parts could interfere with the overall aesthetic of the new bridge landscape, Betts said. For years, Friends of Gateway Park, a public interest arts advocacy group, has been promoting reuse of the bridge steel and preservation on the site. Mark Sinclair, a San Francisco-based structural engineer and Friends of Gateway Park member, said that he would like to see a portion of the old bridge preserved in some form — ideally with a section large enough to illustrate the intricate design that no longer exists in modern engineering. "There's a huge pool of talent here that could do amazing things with [the steel]," said Leslie Pritchett, an Oakland-based public art consultant and advocate who is also a member of Friends of Gateway Park. "The opportunity to build from the old Bay Bridge will never, ever again be available."